Just like humans, dogs normally carry bacteria on their skin in balanced numbers. The bacteria that dogs carry is called Staphylococcus pseudintermedius while humans carry Staphylococcus aureus. In healthy dogs the bacteria do not pose a problem. 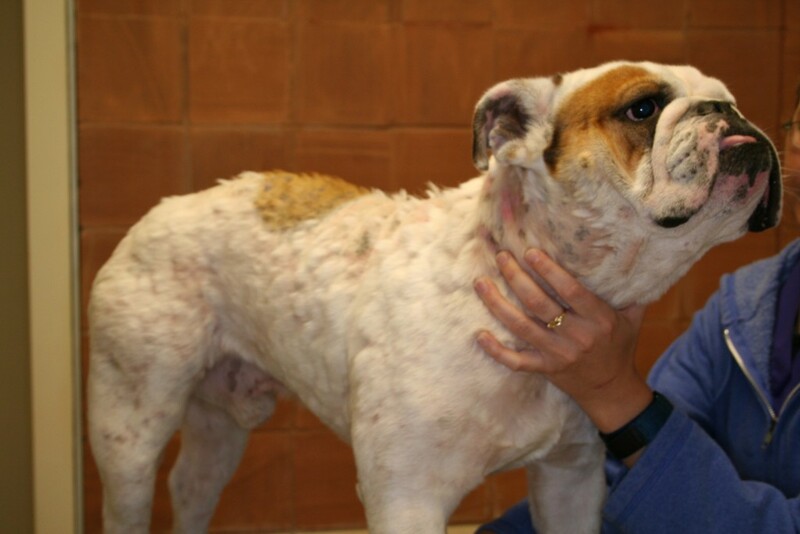 It is common for veterinarians to see dogs with an overgrowth, or over colonization of the bacteria. 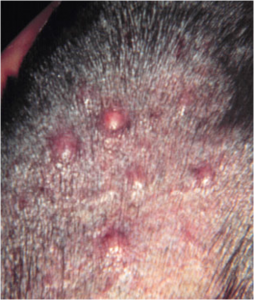 The classic lesions of a staph infection are the papule (A), which develops into a pustule (B), which then turns to an epidermal collarette (C). 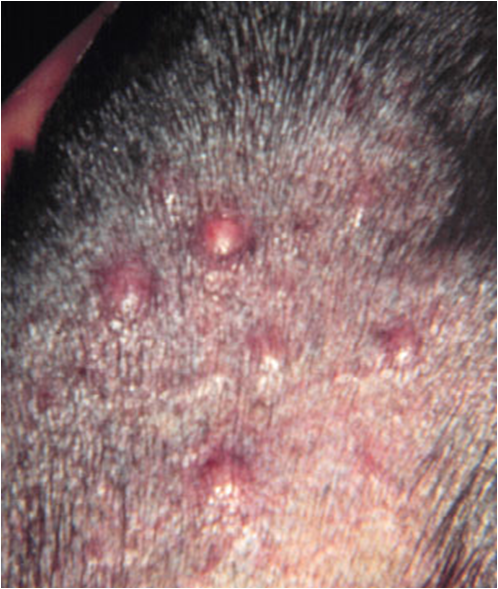 In short coat breeds (such as the Pit bull, Doberman, Boxer, etc) a staph infection may look like patchy hair loss or mistakenly diagnosed as hives (D). 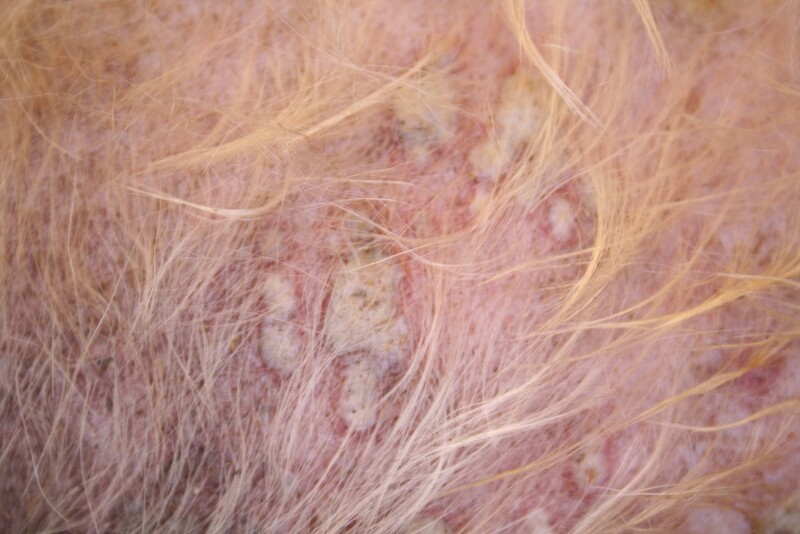 Your veterinarian may recommend topical therapy for mild or focal infection. Antimicrobial shampoos, sprays and creams are available and studies have shown this approach can be beneficial even for resistant strains of staph[i]. A systemic antibiotic may be necessary if the infection is widespread or moderate to severe. Superficial infections need a minimum of 3 weeks of therapy while deep infections may need 4-8 weeks of therapy. It is very important to treat until the infection is completely clear and thus you should adhere to your veterinarian’s directions for therapy and resist the temptation to stop therapy just because your pet “looks better”. What if the infection keeps recurring? What if my pet is not responding to antibiotic therapy? Your pet may have acquired a resistant strain of staph and additional testing, called bacterial culture and sensitivity, may be necessary. This is typically a non-invasive procedure in which a swab is applied to lesions then sent to an outside lab, the bacteria are grown and then tested against a panel of antibiotics to see which will limit growth of the bacteria. For more information about resistant Staphylococcal infections visit the www.wormsandgermsblog.com website. Alternatively, your pet may not have a staph infection as there are other skin diseases that can look very similar including, but not limited to, a mite overgrowth in the hair follicle (demodicosis), a fungal infection (dermatophytosis, aka ringworm) or an immune mediated disease (pemphigus foliaceus). [i] Muller and Kirk’s Small Animal Dermatology, 7th edition. In chapter 4 on Bacterial Skin Disease. Page 184-205.